Hans-Jürgen Greif's novel calls forth, with the impetuous elegance of a baroque opera, the power of the human voice to stir our souls. It places the reader under the spell of a mythical voice-a castrato of our time.Lennart Teufel, a young man with a beautiful voice and great musical talent, is mutilated and orphaned in an automobile accident. Having recognized the boy's potential, a demanding and brilliant Italian teacher takes him under her protection, shields him from the outside world, trains him and recreates what the musical world had lost long ago-an irresistible, overwhelming voice to which nobody can resist. At the teacher's death, a former student of hers, now a renowned music critic, takes charge of the singer who has chosen a stage name bearing grave consequences, "Orfeo." On his path to celebrity, he unleashes passions he cannot control, endangering his life.Set in modern Germany, Hans-Jürgen Greif's novel communicates the power of the Italian castrati. He revives their exceptional performances and their hypnotic power over audiences. At the same time, the novel opens up questions of androgyny and human identity. Hans-Jürgen Greif was born in Germany, Hans-Jürgen Greif has taught French and German literature at Laval University, in Quebec City where he presently coaches singers at the Conservatory of Music. His novels, novellas and short stories have been translated into English, German and Spanish. He was nominated for the Governor General's Award for Fiction in 1990 for L'autre Pandore. 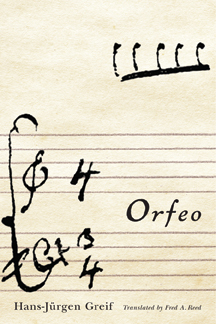 The French-language version of Orfeo was nominated for the Prix France-Québec in 2004 and won the Prix d'excellence; Prix du Salon du livre [Québec] in 2004.